Born, raised, and trained in Vienna, Austria, Viktor Frankl launched a neurology and psychiatry career in 1937 within the shadow of Nazi Germany. Five short years later Frankl and his family were sent to the concentration camps of War World Two wherein his father, mother, brother and wife would die. The next three years would be some of the most difficult years Frankl life; yet they also proved the launching pad for his later career as the founder of logotherapy. 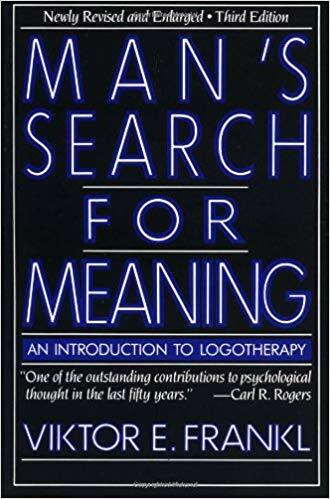 Originally written over the course of nine successive days in 1945 soon after Frankl was liberated from a concentration camp, the book Man’s Search for Meaning: An Introduction to Logotherapy is partly biographical and partly scholarly. The first part tells of Frankl’s experiences in the concentration camps. The second part, which was added to the book in 1962, gives readers a basic introduction to logotherapy, a school of Psychotherapy founded by Frankl. The final section was added to Man’s Search for Meaning in 1984 and deals with how humanity continues to have hope in the face of pain, guilt and death. The second part of the book focused on introducing the reader to the world of logotherapy. Logotherapy is a form of psychotherapy developed by Frankl that focuses on the “meanings to be fulfilled by the patient in his future.” In other words, it seeks to help each person discover the meaning of their lives though either accomplishing a deed, experiencing something or encountering someone, or through the attitude one takes when experiencing suffering. At its core logotherapy is built upon the thesis that humanity is “ultimately self-determining” and is not bound by the conditions or genetics provided to them by fate. Humanity, therefore, has the freedom to change both the world and themselves for the better if they only choose to do so. The third and last part of the book deals with the question of “can life retain its potential meaning in spite of its tragic aspects?” In answering this question, Frankl reminds the reader that “happiness cannot be pursued.” Rather, it is something that one finds once they have a meaning to life. Happiness is a by-product of a meaningful life that comes naturally no matter the situations or conditions in which one finds themselves. Building upon this, Frankl explores how the different avenues of finding meaning in life help combat the tragic triad of pain, guilt and death. Viktor E. Frankl, Man’s Search for Meaning: An Introduction to Logotherapy (New York: Simon & Schuster, 1984), 12. Viktor E. Frankl, Man’s Search for Meaning, 18. Viktor E. Frankl, Man’s Search for Meaning, 84. Viktor E. Frankl, Man’s Search for Meaning, 104. Viktor E. Frankl, Man’s Search for Meaning, 115. Viktor E. Frankl, Man’s Search for Meaning, 133. Viktor E. Frankl, Man’s Search for Meaning, 139. Viktor E. Frankl, Man’s Search for Meaning, 140. Viktor E. Frankl, Man’s Search for Meaning, 145.